Sophomore guard Thomas Allen Jr. tied his career high with 18 points on 6-of-9 shooting (5-of-6 from 3) and James Palmer Jr. added 17 points on 6-of-17 from the field, but the only other Husker with more than five points was junior Isaiah Roby with 10 points on 3-of-11 shooting. Nebraska (13-11, 3-10 Big Ten) shot 10-of-24 from 3 but only 11-of-31 inside the arc and only attempted 13 free throws. Purdue (17-6, 10-2) shot 50.9 percent from the field and outscored Nebraska 34-22 in the paint and 15-6 in second-chance points. 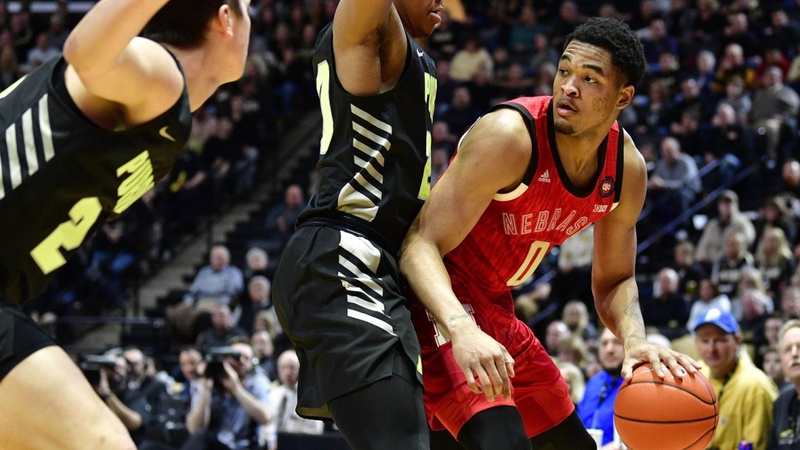 Nebraska took an 8-4 lead early with a 6-0 run, but the Boilermakers responded with seven straight to pull ahead 11-8 at the first media timeout. The Boilermakers slowed down soon after, however, missing four straight shots and allowing Nebraska to take a 19-18 lead on a layup by sophomore wing Nana Akenten. The Huskers hit three triples to take a 28-25 lead, giving them five makes in their first nine attempts. Then the scoring drought hit. Nebraska missed six straight shots, allowing Purdue to take the lead with a 6-0 run. Watson split a pair of free throws to end the run but Purdue’s 7-foot-2 center Matt Haarms rebounded a miss by Carsen Edwards and slammed it home with less than 10 seconds to play. Palmer pushed the ball up the floor and drew a foul, hitting both free throws to make it 33-31 Purdue at halftime. Palmer led the Huskers with 11 points on 4-of-8 shooting in the first half while Nebraska held Edwards to nine points on 10 shot attempts. Isaiah Roby threw down a dunk on Nebraska’s first possession of the second half to tie the game up but that proved to be the highlight of the half as the Boilermakers put together a 14-2 run during which they hit five straight shots. Tim Miles called a timeout to regroup and Allen knocked down a 3-pointer out of the break to get the Huskers going again. Allen knocked down 3s on Nebraska next two possessions, but the Huskers couldn't get stops and only cut the lead down to eight. Edwards scored five straight to push it back to 13 before Allen converted a three-point play midway through that half that made it 57-47 Purdue. Nobel Eastern hit pair of free throws but Nebraska countered with a 3 by Roby but Eastern followed up a missed 3 by Edwards for the put-back. After trading scores, a 3-pointer by Watson — his only bucket of the game — cut it to eight with 7:16 to play. Free throws by Grady Eifert pushed the lead to 10, then a layup by Roby cut it back to eight. That was as close as Nebraska would get. The Huskers went nearly four minutes until they converted another field goal as Purdue put together an 8-1 run. Palmer scored inside to end the drought but Purdue closed out the game with an 8-2 run as the Huskers ran out of gas. Purdue shot nearly 60 percent from the field in the second half while the Huskers came in just under 40 percent. Edwards got loose for 18 points on 4-of-6 form the field and 9-of-9 from the line to finish with a game-high 27, one of four Purdue starters in double figures. Next up for the Huskers is a rematch with Minnesota on Wednesday. The Huskers lost in Minneapolis 85-78 back on Dec. 5. Tipoff at Pinnacle Bank Arena is set for 8 p.m. on BTN.